What might Netanyahu do when his American mob tells him Romney won’t win? Even before his latest reported gaffe the polls were indicating that Romney will fail in his Zionist-backed bid to deny President Obama a second term in the White House. After the Republican presidential candidate tried and failed to make political capital out of the killing of the American ambassador and three of his colleagues in Libya, Obama said (on CBS’s 60 Minutes) “Governor Romney seems to have a tendency to shoot first and aim later.” Staying with the shooting metaphor, it seems to me that with his latest gaffe Romney has shot himself in both feet and possibly elsewhere in his anatomy. “There are 47% of the country who will vote for the president no matter what.” And this 47% were people, he added, “who believe they are victims, who believe the government has a responsibility to take care of them, who believe they are entitled to health care, to food, to housing, to you name it. It is not my job to worry about these people.” (We know that’s what Romney did say because he was secretly filmed saying it). So to my headline question: What might Israeli Prime Minister Netanyahu do when his American sponsors tell him, possibly in the coming few days, that Romney isn’t going to win? A few weeks ago I would have answered my headline question by saying there was more than a 50-50 chance that if and when he was told that Romney was not going to win the race for the White House, Netanyahu would give the “Go” signal for an attack on Iran, in the belief that in order to best protect his election prospects Obama would be forced to commit American weapons and forces. But in a few weeks things have changed a lot. Not only is Obama now well placed to secure a second term, if only by default on Romney’s part, there is also a growing realization in America that, on Netanyahu’s behalf, the Zionist lobby and its stooges in Congress have overplayed their hand in trying to influence the American election and push the US into war. (In my last post I quoted TIME‘s much respected Joe Klein describing this influence as “outrageous and disgusting… as cynical as it is brazen.” I have no doubt that Klein was speaking for many Americans, and probably more than a few Republicans as well as most Democrats). Most significant of all are poll findings that most Americans do not want their country to go to war with Iran even if Israel starts it. Perhaps most remarkable of all was a poll by the Chicago Council on Global Affairs. More than half of the respondents said that if Israel starts a war with Iran, the US should not leap to Israel’s defense. So if and when he is told that Romney won’t be the next president, Netanyahu will have a problem. He could no longer be certain that he can cause Obama to go to war in what remains of his first term. While I was thinking about what Netanyahu might actually do, I recalled a conversation I had with Ezer Weizman in early 1980 when he was the defense minister in Begin’s coalition government. What follows is a part of that conversation as set down in my book Zionism: The Real Enemy of the Jews, Volume Three sub-titled Conflict Without End?, Chapter 12 The Blood Oath. Ezer was half an hour late for an appointment I had with him and I had been shown into his outer office to wait for him. I heard the sound of heavy, weary footsteps coming up the stone stairs. When Ezer filled the frame of the doorway to the outer office of his inner sanctum it was obvious that he was not his usual energetic, breezy self. He had the look of a haunted man. He managed a smile and said “Shalom.” Then, without another word, he put an arm around my shoulder and walked me into his office. He closed the door, nodded me to a seat on the other side of his ministerial desk and flopped into his own chair. He pushed it back and plonked his feet on the desk. He was looking straight at me but through me, to something only visible in his imagination. Eventually he spoke. On reflection I am sure he told me what he did only because I was there. He needed to tell somebody and it happened by chance to be me. In the event of a government decision to withdraw, Ezer said, Sharon was pledged to set up headquarters on the West Bank, and those in Israel’s armed forces who were loyal to him would make common cause with the armed settlers who wanted to fight. I told Ezer what Peres had said to me weeks previously – that Begin was creating the conditions for a Jewish civil war, knowing, as Peres had put it, that no Israeli prime minister would trigger it by agreeing to withdraw from the West Bank. Ezer nodded and then asked me a question. Did I think Sharon would act in accordance with the blood oath he and others had signed? Question: Is Netanyahu mad enough to order an attack on Iran in what remains of Obama’s first term without the president’s blessing and American participation? It’s because Romney is so ignorant about foreign policy matters that he is delighted to read from Zionism’s script. What a disaster for America and the world a President Romney would be! In one of his most stupid statements while grovelling for Zionist organized campaign funds and votes, Romney accused Obama of “throwing Israel under a bus.” Perhaps somebody should say it’s time for Obama to throw Romney and Netanyahu under it. (Okay, I just said it). 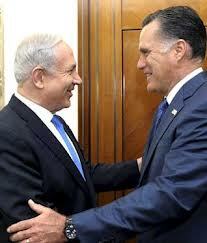 Netanyahu and Romney are birds of the feather - their mouths are far bigger than their brains. Furthermore, both live in their self-denial. However, the most of American Jewish lobby groups believe Obama is more reliable when it comes to Jewish and Israeli interests than Romney who is unpredictable and surrounded by White supremacist Zionist Christians. Israel Lobby is trying its best to demean Obama for not invading Iran before November. Noam Neusner, Dubya Bush’s former Jewish speechwriter, in an Op-Ed in Jewish daily Forward (August 29, 2012), claimed that ‘Mitt Romney is Real Tikkum Olam Candidate’. Therefore, he suggests that Jews who care for their Jewish values; individual freedom and prosperity (big banks and bailouts), should vote for GOP candidate Mitt Romney, a Mormon, whom Jewish editor Mark Ames of the Exile magazine calls The Curse of Joseph Smith. Alan, I hope Netanyahu takes his little red war wagon and goes home - and shuts the hell up. I think it may actually happen. Most of Bibi's desperation comes from worrying that Obama will win re-election. If it becomes obvious that it's a done deal, he won't have any choice than to go back to Tel Aviv with his tail between his legs. He might launch a war; or he might try to launch one. All intelligence from the US is in agreement. Any israeli attempt will fail. Without doubt; cooler minds will be watching over Netinyahoo; from both ersatz israel and the US. An attempt from zion will hand Iran international and legal justification to carry out any and all acts necessary to ensure the safety and security of it's people. Here is an argument Iran might use. A failed precision bombing attack by Netinyahoo might anger this lunatic to such an extent, that Iranians could justifiably fear and argue the possibility of him initiating a general nuclear war. To protect their country, Iran could turn the tables on the zionist state. Confront ersatz israel with it's illegal nuclear missiles. Demand israel's stockpiles be destroyed. Demand the UN place heavy crippling international sanctions on Apartheid israel. When those sanctions are not applied, or fail, Iran could then use the exact same arguments (word for word) that the israelis have used; and go it alone to assassinate zionist scientists; government officials etc. All doors would be open to it; as they have the right to self defense etc etc. Netinyahoo will try to initiate the attack. Others will move to arrest him. While in prison, he will hang himself. People will wonder where the rope came from. No matter what the "polls" tell us...no what the exit polls inform us...REMEMBER 2000 election...remember all the ballots that were tossed ? (92,000 in certain African American precincts alone)...and then in 2004, similar large numbers of ballots were thrown out by their Sec of State. This time 'round there is a more sinister but open effort to Disenfranchise tens of thousands of voters in states which voted for Obama in 2008 by incredibly limiting and complicated new VOTER ID requirements and it has been surmised that states like Pennsylvania may be fully compromised with an overall loss of 1 Million voters alone. The poor, elderly and African American voters will be particularly affected by this mandate in PA despite individual voter histories of more than 50 or 60 years without being able to obtain a "birth certificate" at this point they will not be allowed to vote. The GOP is quite happily announcing that they expect Pennsylvania to "go for Romney in a big way" because of this new voter ID mandate. Lots of surprises....and a Supreme Court that just might dare to repeat their outrageous decision to hand it over. Remember, the US always stops the UN Security Council from imposing any punishments on Israel. So don't hold your breath. And the Al Gore 2000 election fiasco allowed the SCOTUS to set a dangerous precedent. Well, N'yahu dearly loves his war (his American war) on Iran. But to me this is all smoke-screen for the spread of the settlements. A better question is: What will Obama do once he wins? Will he dare (4 years later) to tell the world on Nov. 7 that it is now USA policy that the settlements are illegal and the wall is illegal and that settlers should be removed and settlements and wall dismantled? And to place before the UNSC on Nov 8 a resolution calling for removal of settlers and settlements and wall, all within a time certain (a year, perhaps)? Will he see that that is the only hope? Hope so, for it is the only hope. The lame "peace process" is dead and buried; Netanyahu needs not even a mosquito net to cover settlement building activity. It's ongoing, has been ongoing, and unfortunately will continue along with property seizures and home demolitions. If any attempt is made by the UN to remove settlers en masse, Bibi and the US Congress will move heaven and earth to stop it. Latest news of course is that the US and China are headed for a bust up. I don't believe that the US will start a war against Iran now. Lets all just hope now that zion starts something. I never believed the US would attack Iran; it would lose standing in the world it cannot afford to lose, and the US economy simply cannot withstand the strain of another war. I would also venture a guess that its military cannot, either. "Netanyahu’s been predicting the imminent appearance of an Iranian Bomb since at least 1992, when he declared, “Iran will have the bomb by 1997.” He’s a Chicken Little. The sky has not fallen on Israel. Netanyahu’s a Boy Who Cried Wolf. Year after year, the intelligence reports confirming a military program just don’t come in. Obama, who was caught on open mike agreeing with Sarkozy’s depiction of him as a liar, no doubt knows the Israeli prime minister is a master of sensationalistic distortion. It’s there in every piece of his argument." I have been personally aware of zion's threat of a war against Iran for 4-5 years or so; and I have never swayed from the belief that ersatz israel was just trying to manoeuver the US into attacking Iran. This position was not arrived at through wishful thinking but based on hard nosed assessments expressed in 3-4 articles by American Generals. It was never going to happen. What makes this issue and the events surrounding it; so exciting, is that it has become a significant stumbling block for zion. It is both a loss of face and a loss of support and will, and as has been outlined; a spotlight on the political processes operating between the US and the ersatz israel. That act alone will weaken the relationship, and the unbalanced support towards Apartheid israel. Anyway you look at this issue, zion has lost and so has continued the downward slope it has been set on since 2006. Good news for all humanitarians. "I have never swayed from the belief that ersatz israel was just trying to manoeuver the US into attacking Iran. This position was not arrived at through wishful thinking"
No I wasn't wishing the US would attack Iran. I must be very tired. Someone please show me the evidence that the US and Israel have anything to do with what is going on in Syria. Please. Also, there is no evidence that Israel had anything to do with that stupid video. Conjecture is not fact. The US is not backing the Syrian war; there is no evidence of it and only very wild and convoluted theories. The US is absolutely backing the Syrian war and just yesterday they announced increased aid to the insurgents. France went further and declared they would begin supplying lethal aid to the insurgents. You will see the US/NATO/Turkey attacking Syria by end of this year or early next year. This is a strategic necessity before attacking Iran. Post a link to whatever substantiation you have. Otherwise, it's just your daydream. Bottom line is they own us. There are no americans left in our leadership, only lackey,s to jewish money. Oh America what have you fallen to.